If you’re heading for the open road this winter, and you know that road is coated in snow and ice, then it’s wise to toss on tires that can handle the adverse conditions. After all, with standard tires, you could end up in a ditch, waiting in the cold for a tow truck to save your day. So, instead of taking a chance, you’re proactively opting to install tires that can handle slippery roads. But, alas, you can’t decide between all-weather tires and snow tires. How do you settle on the right option for you? Well, it will all depend on how you plan on using your vehicle this winter. Each of these tire options are designed to take on difficult roads, and each will perform fairly well over ice and snow. That said, all-weather tires and snow tires offer unique benefits and they have unique drawbacks that you should consider as you invest in your next set of treads. Here are a few of the pros and cons that may weigh in on your decision. Before we start, you should be wary of the difference in purpose and design between all-weather and snow tires. So, what exactly are all-weather tires? Well, the answer to that question is in the name. All-weather tires are designed to maintain traction regardless of what Mother Nature is throwing on the pavement. All-weather tires are built to perform in all conditions, not just the snow. 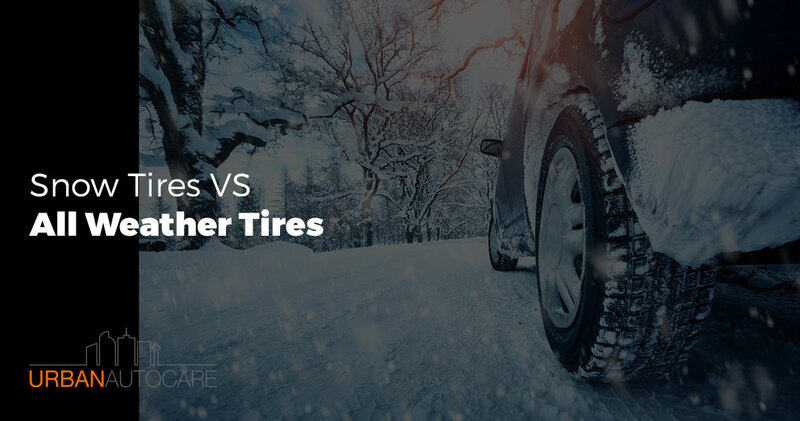 Take note, unlike all-season tires (which sound oddly close), all-weather tires are built to perform even when there’s stuff on the road (like mud and snow). All-season tires, on the other hand, are simply okay at handling the temperature changes between seasons, some rain, and very light snow. All-weather tires have unique treads that are excellent at holding the road whether you’re on dry pavement, wet roads, dirt roads, or somewhat snowy roads. These tires have deep grooves which help to reduce hydroplaning on wet roads. Plus, they’re fairly flexible for dirt roads and that flexibility helps a bit in the snow. That said, they aren’t as flexible as their winter cousins. Improved traction for most surfaces: All-weather tires are great for mud, normal roads, rain, you name it. And they’re decent on ice and snow. If you’re constantly travelling over different terrain and in different temperatures, then you’ll love the versatility of all-weather tires. A year-round solution: All-weather tires can remain on your vehicle year round. That’s good news if you don’t have time to swap out your tires every time a storm moves through. Decent performance on ice: All-weather tires perform fairly well on ice, and they can stop and turn while retaining decent traction. If you only spend a bit of time riding over icy roads, then all-weather tires should prove sufficient. Okay performance on snow: The same holds true for snowy roads. All-weather tires have treads which can still maintain traction over some snow and they’re quite good with slush. So, once again, all-weather tires may be sufficient for drivers that spend a bit of time in the white stuff. Less expense: While snow tires and all-weather tires are reasonably similar in price, you may only need one set of tires with all-weather tires. Oftentimes, folks opt to buy a set of snow tires in addition to their standard set, and they may buy wheels to make it easy to swap out those tires season after season. If you’re not going to buy new wheels for your car, then you may end up at the auto shop twice per year, swapping out winter tires for your regular set and vice-versa. Flexibility: Unlike snow tires, some all-weather tires get stiff in cold conditions. That’s bad news for icy roads, since you won’t have much surface contact between the tire and the road — which means that you’ll have poor traction. That said, you may be able to find all-weather tires that are designed to remain flexible in cold weather. Look for a snowflake symbol on certain all-weather tires, as this indicates that they are designed for colder weather. Stopping on ice: Even with improvements over all-season tires, all-weather tires still underperform compared to snow tires. These tires simply can’t stop as quickly in emergency stops as snow tires, and that may prove to be a safety hazard if you’re constantly travelling over icy roads. Deep snow: All-weather tires can’t handle deep snow that well, since their treads may just cause the tire to bury itself. Snow tires can tackle some of the deeper stuff, gaining traction even when there’s plenty of snow underneath the tire. Snow tires are just that: tires built for the snow… and ice. Since roads are destined to be dusted with snow and covered with ice here in Colorado, snow tires are a smart choice to maintain as much control as possible over these conditions. Snow tires are designed to be more flexible than other tires, and they have grooves which are specifically shaped to gain traction as they press into snow, slush, and ice. Beyond that, they may be outfitted with additional features (like studs and micro pumps) which further improve traction on difficult winter roads. Excellent snow and ice performance: Your vehicle’s performance on snowy and icy roads will be unparalleled. With snow tires, you won’t lose traction except in the most extreme conditions, and you’ll be able to regain traction more quickly, should your tires begin to lose their grip on the road. Flexibility: Snow tires are more flexible than other tires even in cold temperatures, thanks to the specific types of rubber used in these tires. That’s an important feature, since extra flexibility means more surface contact between your tires and the road — and that means more traction. You’ll enjoy better control when you turn, speed up, and stop thanks to the flexibility of your snow tires. Additional features for traction: Depending on the tire that you purchase, your tires may have additional features that are designed specifically for improved performance on icy roads. Modern snow tires are often outfitted with micro pumps, which are essentially small closed tubes in the tread of the tire. These “pumps” act as small suction cups on ice, which means that they’ll temporarily cling to the surface of icy roads, even when other tires would lose traction. On top of that, some snow tires are studded. These metal studs act like tiny ice picks, ensnaring themselves in the ice as you traverse the surface. Again, you’ll gain better control over icy roads with studs. Overall safety: All of the aforementioned features add to the safety of your vehicle when you’re navigating over snow and ice covered roads. You’ll be able to turn more easily without losing traction. You’ll be able to better control your acceleration. And you’ll be able to stop more quickly when you need to. That means that you’ll have peace of mind, even when winter’s roads are trying. Legal requirements: Under the Colorado Department of Transportation’s (CDOT) direction a Traction Law may be put into effect for certain roads when winter conditions are too dangerous for standard tires. Under these conditions, you will have to meet the following criteria, as posted by CDOT: “During an active Traction Law (also known as a Code 15), motorists must have either snow tires, tires with the mud/snow (M+S) designation, or a four-wheel/all-wheel drive vehicle. All tires must have a minimum one-eighth inch tread. You can also install chains or an alternative traction device (like AutoSock) to be in compliance with the law if your tires aren’t adequate.” So, if you’re about to head out on the road and there is a Code 15 issued by CDOT, you’ll be ready and your vehicle will be legal for driving. Swapping out tires: Swapping out your tires can be a bit inconvenient, and you’ll have to do it at least twice per year (once as the snow falls in late autumn or early winter, and once as the roads dry up in the spring). Cost: As we mentioned, snow tires may prove to be more pricey than a set of all-weather tires. You may want to invest in an extra set of wheels to make it easy to swap out your tires as the seasons pass. And you’ll have to pay a mechanic or tire specialist to swap out your tires each winter if you aren’t planning on buying wheels to match your snow tires. That may be a small price to pay though, for added safety on dangerous Colorado roads. Risk of damage: If you don’t swap out your winter tires as you continue to drive during the warmer months, then you put your tires at risk of becoming damaged. Snow tires aren’t built to last on normal roads in warm weather conditions, since they are more flexible and have deeper treads than other tires. Plus, if your snow tires are outfitted with studs, these studs will wear down quickly in regular road conditions. That’s why swapping out your tires is so crucial. If you’re looking for the best tires for your ride and the roads upon which you choose to travel, then you should stop by our shop. We cater to our neighbors throughout Denver with tire sales and service, and we’d be happy to throw your next set of tires onto your vehicle. Feel free to reach out to us if you’re curious about our services and products!